Jack Ryan—the new Amazon Prime video series about Tom Clancy’s CIA analyst character—isn’t totally rotten, but is instead an alright work by talented people that could have been much much better if they hadn’t made, or been forced to make, several compromises with political correctness. By way of contrast, Peppermint—Jennifer Garner’s “Punisher, but with Jennifer Garner” movie—doesn’t noticeably pull its punches, even faced with the same unpalatable problem: the stunning rudeness of reality. Existence, you see, doesn’t comport itself according to politically correct pieties. Unlike what certain elements want you to believe, there really are murderous Muslim terrorists and murderous Mexican drug cartels. They exist, but putting them into your fiction is a potential career-ender in modern Hollywood, which is why it’s so surprising that both works chose to do so. 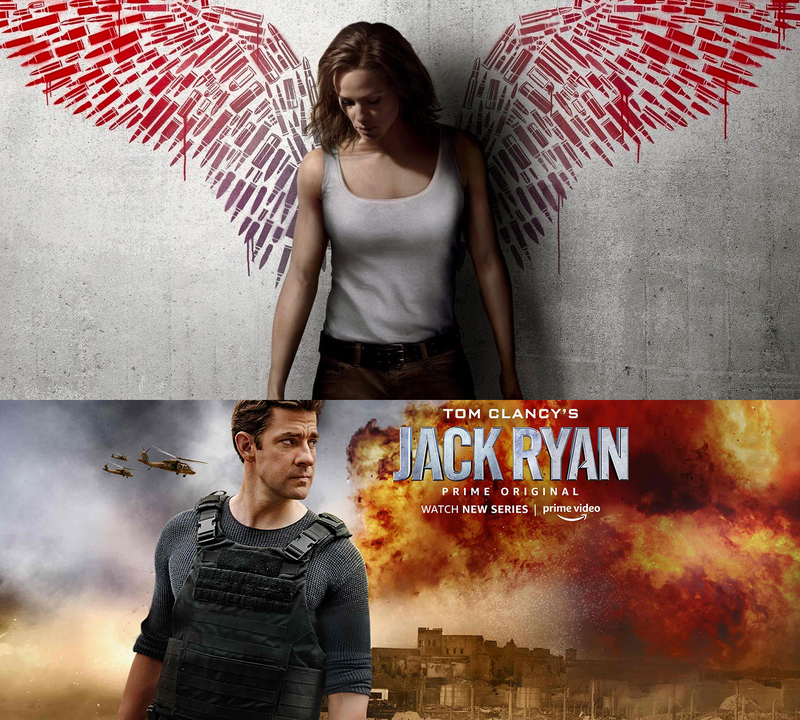 The entire season of Jack Ryan (like Netflix, 8 episodes revolving around the same story, only unlike Netflix, Amazon makes it work) is one long battle against actual Muslim terrorists, people who murder 300 innocents with sarin gas at a Paris funeral for a priest and who plot even bigger body counts after that. Their explicit motivations are revenge on the West and establishing a caliphate, and the show doesn’t flinch from depicting their rage and bloodthirstiness up to and including keeping and selling captured Westerners as slaves and using children as suicide bombers against American troops and defecting Iraqi civilians (the subsequent explosion and helicopter crash replacing the original origin of Jack Ryan, CIA analyst). These are BAD GUYS, alright? And that’s a minor miracle when even Ben Affleck’s The Sum of All Fears rewrote Clancy’s book so Ryan fought not Muslim terrorists but German Neo-Nazis… in 2002. Peppermint is a smaller story about a mom who loses her daughter and husband in a horrific drive-by. The murderers are a gang whose face tattoos and Hispanic ethnic identity are clearly meant to evoke MS-13, and who are linked to an unspecified but clearly Mexican drug cartel. The gang arranges the murders, buys off or intimidates police, district attorneys, and judges, and deprives the mother of well-deserved justice. The criminals even have a smug Peter Strzok moment, laughing at the bereaving mother in the courtroom just after she’s given testimony, and just after the crooked judge has dismissed the case against them. Nor are these the only murders we witness them arranging. Again, these are BAD GUYS. Jack Ryan spends a lot of time trying to walk it back, undercutting their seeming-boldness. The main bad guy’s family is killed in an air strike (in the very first scene in the entire series) on a civilian village in the Bekaa Valley, Lebanon, in 1983. The problem is that America (whom many reviewers assumed was the culprit) never attacked anywhere in the Bekaa in 1983, while both the French and the Israelis only attacked military targets—no civilian villages were bombed, only Iranian Revolutionary Guard locations (Lebanon claims 1 civilian death from these attacks, not the dozens or hundreds depicted in the show). This attack never happened, and yet the show chooses it as the beginning of the main Bad Guy’s turn from an innocent child into a violent terrorist mastermind. This turn is later cemented when he is arrested by racist French policemen who throw him into prison because of racism, where he is radicalized by a Muslim cleric. One day he’s an innocent would-be banker with a bold plan to modernize and revolutionize France’s banking system, rejected by the French because they’re racists, and a year later he’s a jihadi. Because of the murder of innocent civilians by the West, and racist rejection of an innocent, peaceful businessman by the French, “the next Bin Laden” is born—we created our own worst foe. “He is the monster we created, had we only treated him better he’d have never done what he did” is a pretty odious (but altogether too common) message, and it cheapens and weakens what could have been a great story. The show also futzes with Adm Greer’s (Ryan’s boss and mentor, played by James Earl Jones in 1990’s The Hunt for Red October) past and personality to score PC points, turning him into a Muslim who converted so he could marry his Muslim (now ex-) wife. He’s explicitly shown as having abandoned the religion after the divorce, but the show still gives him a chance to virtue signal when a racist French secret agent complains about the Muslims in France and later he decides to go back to church (er… back to the mosque?) because of all this. Okay, fine, the show is more anti-French than anti-American, and I usually have no problems tossing a few barbs France’s way, but this is a bit too much. You don’t strengthen a story or a villain by blaming others for his villainy. People make their own choices, and bear responsibility for them. Blaming the victims for the crime is ridiculous, and this message (along with several other PC moments too lengthy to relate here, like the drone pilot who goes on pilgrimage from his air base just outside Las Vegas to the Middle Eastern village where the family of his last—mistakenly identified—target live to give them $60,000 to ease their pain) fatally compromise what could have been an excellent series. They had the talent, but in catering to the PC Gestapo, they ruined their work. Peppermint does none of that. (Mostly. Homeless people are presented as completely harmless innocents, but that’s not a plot point and is easily overlooked.) There are corrupt and brutally ruthless gangsters, they decide to make an example of her husband, so they do a drive-by and shoot him down in the street, even as he’s trying to shelter his little girl with his own body, and both die while the mom looks on. Riley North, the wife and mother of the slain, tries to get justice for her family through the legal process, but the gang’s money has bought them influence in the courts and even among the police themselves. She drops out of sight for five years, and on the anniversary of her family’s death, she shows up, armed with an arsenal of military weapons and det cord, and proceeds to dispense her own justice. The Bad Guys try to strike back, they fail, and she proceeds to eliminate them one by one in a series of very cool set pieces. Peppermint is a solid revenge flick, in the vein of Death Wish and The Punisher. You could even non-ironically call the movie the best Punisher flick ever made, because most of them have been pretty awful and this movie absolutely is not. It’s not too long, moves along at a brisk pace, and is solidly entertaining. There isn’t a lot more to say other than “The villains are mostly Hispanic, but the movie never shies away from this, nor does it demonize Hispanic people.” It’s not actually perfect, there’s some bobbles here and there, but it’s a good movie. Go see it. Both shows have come under fire in the media for depicting actual, real villains who actually, really exist in the actual, real world. Their decision to move ahead despite this is bold, and even if Jack Ryan flubbed the execution, both productions deserve nothing but praise for it. My biggest complaint with Jack Ryan is the slow slide into mediocrity. The early episodes are pretty good, but each one gets harder and harder to take.